Lead is a common ingredient in paint used in old houses and children’s toys and it is a poisonous metal. Lead poisoning takes places when too much lead builds up in your body. Lead poisoning is a serious medical condition that can sometimes be fatal. It usually takes months or even years for this buildup to result in poisoning. Children are more likely to get lead poisoning than adults because they tend to put items or fingers in their mouths after touching objects. Lead poisoning can result in both physical and mental problems, which is very dangerous for children since their nervous systems and brains are not fully developed. People who have lead poisoning may not be diagnosed until the level of lead in their blood has become dangerously high. This is because symptoms of lead poisoning do not usually show until very high levels are present. Lead poisoning affects children and adults differently. Symptoms in children: difficulties learning, delayed growth and development, loss of appetite and weight, irritability, fatigue, hearing loss, constipation, vomiting and abdominal pain. Symptoms in adults: mood disorders, memory loss, mental decline, headache, muscle and joint pain, constipation, abdominal pain, high blood pressure, miscarriage or premature delivery in pregnant women, and abnormal or reduced number of sperm in men. Parents and guardians of children under the age of 6 should talk to the child’s doctor about what should be done to decrease the child’s risk of getting lead poisoning. The child should also be tested periodically for lead poisoning if risk factors exist. It is important to seek immediate medical care if you believe that you or your child has been exposed to lead or if there are symptoms of lead poisoning. Lead poisoning can hinder kids' physical and mental development and even cause life-threatening problems. So how to deal with lead poisoning is very important. Removal of lead source is the first step. If the source cannot be removed, measures should focus on how to minimize its exposure: sealing lead paint, wearing gloves when contacting with lead-containing products and washing windows, furniture and floors regularly with a wet cloth. If you have older pipes and fittings in the kitchen and bathroom, run cold water for a while before using them to cook foods. Contact your local health department for recommendations on how to limit exposure to lead and identify risks. Chelation therapy is frequently applied to treat poisoning from toxic levels of certain metals. Inject of EDTA (ethylene diamine tetraacetic acid) or other chemicals to bind mercury, lead and some other metals and eliminate them from the body. Children require lower levels of this therapy than adults. Besides, eating a nutritional, healthy diet that contains adequate iron and calcium also helps in preventing and fighting lead poisoning. Adults whose blood lead levels are higher than 45 mcg/dl are treated most commonly with ethylenediaminetetraacetic acid, or EDTA. Your lead level decides how many EDTA therapy sessions you need. However, it may be unable to fix all damage caused by lead poisoning. 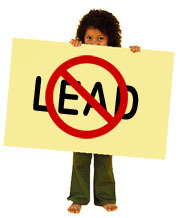 Exposure to lead at work is the most common cause of lead poisoning in adults. Children whose parents work in occupations where lead is present can be exposed to lead dust particles found on their parents' skin and clothes. Products containing lead in the workplace include ammunition, radiation shields, film packets used during the development of dental x-rays, plumbing equipment, fetal monitors, some surgical equipment, ceramic glazes, jet engines and circuit boards. Occupations where workers may encounter exposure to lead include plastic and rubber manufacturers, firing range instructors, battery recyclers and manufacturers, glass manufacturers, constructions workers, auto mechanics, plumbers and fitters, welders, lead smelters and miners, printing workers, copper and zinc smelters, ore processors, solid waste combustion workers, and paint or pigment production workers. Because of its colorful compounds, lead is a popular ingredient in paint. At present, the dust and paint particles containing lead are still the most common reason for kids' lead exposure. For example, with Pica, a common behavior where children eat items that are not food, children's risks of ingesting paint dust and the potential for lead poisoning increase. Small paint chips made with lead can contain hundreds of milligrams of lead and can become lead dusts that land on the floor. This is a danger to children, especially those in the crawling stage. If a home contains lead paint, it is better to seal the paint under lead-free paint in order to minimize the amount of dust and fumes. If the lead paint is in an area that will be adjusted frequently, such as around a door or window, it is important to ensure that all traces of the lead paint have been removed. Areas that contain higher levels of pollution also contain higher levels of lead. Lead found in soil can also be as a result of lead paint that has broken down into dust, or left over from leaded gasoline, pesticides and engine oil. Foundry, smelter industries and contaminated landfills may also contribute to lead levels found in soil. Up to 20% of lead poisoning cases in the United States are as a result of exposure to lead in drinking water. Groundwater and surface water are both at risk for containing lead that was originally found in soil or the atmosphere. Acidic water is most at risk due to its ability of breaking down lead. Plumbing equipment and fixtures that contain lead can also transfer the toxin to drinking water. To reduce the likelihood of lead contamination in public water, chemicals can be added in order to reduce equipment corrosion and balance water pH levels. An ancient cosmetic known as kohl which is produced in parts of Africa, South Asia, and the Middle East. Vinyl mini-blinds from those very old houses may contain lead. Folk remedies, such as greta and azarcon were also nearly entirely made from lead. Lead poisoning has also occurred by the ingestion of small lures used for fishing that are made of lead. Food contaminated by lead can also result in lead poisoning and can occur when the ceramic glaze found on dishes makes its way into food, or if an animal that has been killed using a lead bullet is eaten. Being shot by a lead bullet is also a risk, especially if the bullet becomes lodged in a joint. Medical instruments containing lead may also cause lead poisoning. Some Chinese herbal remedies and Indian Ayurvedic mixtures can contain lead.